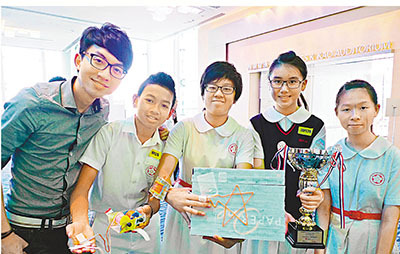 Five of our junior students were championed in the “Hong Kong Student Science Project Competition” with their invention “Eye-Pad”, which assisted visually-impaired students to sketch drawings. They were invited to an exchange tour to South Korea in August for their achievements. AA congratulates our students as well as their teacher Chemistry Mr. John TL Chan! Five S.1-S.3 students, namely Justin Nizal, Wing Shan Lai, Kiki Hong, Michelle Kwan and Thomas Chu, led by Mr. John Chan, joined the “Hong Kong Student Science Competition” co-organized by HKFYG, EdB, Science Museum. Our students discovered the difficulty of visually impaired students to draw things as we could do easily. They utilized simple materials such as Velcro and threads, and invented what they called “Eye-Pad” which could help visually impaired students to have a touch of 3D diagrams. The materials only cost them $7 but the invention did help visually impaired students a lot. They were qualified in the preliminary contest on May 10, and were subsequently named Champion in the final contest yesterday, May 31. They were invited to exchange tours to Shanghai and South Korea. The Spokesman followed, “The invention ‘Eye-Pad’ is another significant achievement after our old boy Mr. Tom KK Chan (2007/7S) obtained the first prize in Intel International Science and Engineering Fair in 2007. Tom was also named after a minor planet as a token of recognition to his achievements. AA hopes that Justin, Wing Shan, Kiki, Michelle, Thomas and other students would take an extra mile to invent more products for the betterment of mankind. At the same time, we would support our students in conducting research, and we also encourage our alma mater to make further efforts and support our students’ invention”. “Hong Kong Students Science Project Competition” is co-organized by the Centre for Creative Science and Technology of the Hong Kong Federation of Youth Groups, Education Bureau, Hong Kong Science Museum, and was supported by the Innovations and Technology Commission and Hong Kong Science and Technology Parks. Since 1998, it has become a core activity of the government in promoting innovation and technology, and was supported by the academia and the business sector. It aims at arousing young people’s interest in science and technology, and encourages them to explore new innovations. Through presentations of inventions to the general public, participants could learn to strengthen their team spirit and communication ability. Some selected teams might even be sponsored to conduct overseas visits and exchanges to broaden their horizons.